Just under 70% of U.S. households have a pet, according to the National Pet Owners Survey. It probably comes as no surprise that the survey also found that dogs were the most popular pet for American households. 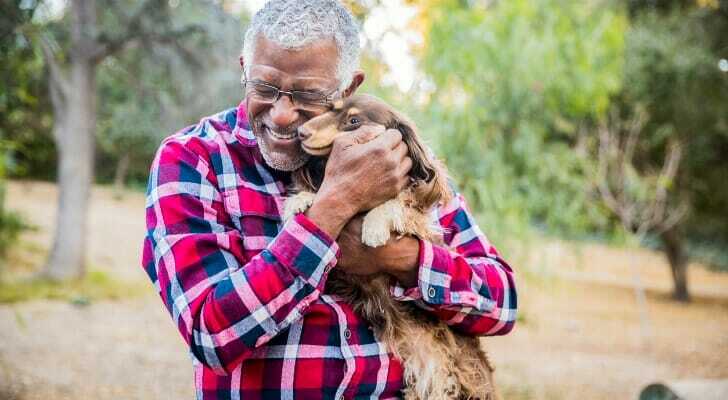 Of the 85 million pet-owning households, 60.2 million of them opt for a pooch. But as any dog-owning family knows, the quality of life for you and your dog can be heavily dependent on where you live. Dog-friendly cities contain walkable streets, runnable parks and access to affordable mortgages. In order to find the most dog-friendly cities in America, SmartAsset looked at data on six different factors. We looked at median home value, dog parks, walk score, dog-friendly restaurants, dog-friendly shops and average amount of precipitation per year. Check out our data and methodology below to see where we got our data and how we put it together to create our final ranks. This is the 2018 edition of this study. Check out the 2017 version here. Go west – Seven of the top 10 most dog-friendly cities are in western states. California in particular scores well with its sunny weather and plentiful dog parks. However, our top three cities are all non-California cities and have what many California city residents dream of: affordable housing. You will have to pay if you want the best for your pup – If you want to live in a dog-friendly city you’ll likely need to deep into your savings account. According to our data, none of the 20 most affordable cities in the country are a top 10 dog-friendly city. In fact, two of the most dog-friendly cities are also among the 10 most expensive cities. Tucson, Arizona takes the top spot as the most dog-friendly city in the study. It barely ever rains in Tucson, so that’s one dog-walking obstacle you won’t need to worry about. Other pluses for Tucson dog owners are the dog-friendly amenities. According to our research, there are 246 dog-friendly restaurants and four dog-friendly shopping centers. So, if you’re going out for lunch or running errands, odds are you’ll be able to bring your beloved pet with you. Finally, Tucson is the most affordable city in our top 10, so living here means you can afford to splurge on treats for Fido. Another dry, southwestern city takes the second spot. This city has some of the most dog-friendly infrastructure in the study. 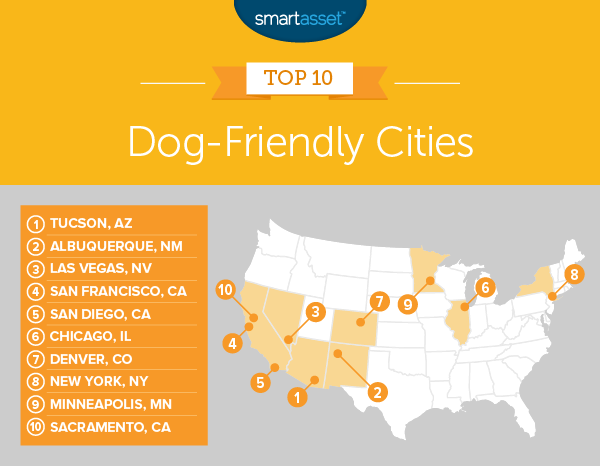 With 2.3 dog parks per 100,000 residents, 171 dog-friendly restaurants and three dog friendly shopping centers, Albuquerque ranks no lower than 25th for our dog-related metrics. The city also ranks in the top 20 for precipitation, with just 28 rainy days per year. It’s unlikely any sudden rainstorms will ruin your dog-walking plans. If you love taking your dog to dog parks, you will love Las Vegas. This city has four dog parks per 100,000 residents, the fifth-most in our study. And you won’t have to check the weather reports to find a good time to hang out at your local park. Las Vegas only sees rain about 14 days per year, according to our data. One concern may be how much money you have left to spend on your pup. While the median home value of $228,300 in Las Vegas is relatively low compared to home values in our other top 10 cities, it rates above average in our study. Living in an unwalkable city can turn your daily dog walks into a hassle. That is not a problem in San Francisco. As the third-most walkable city in America, you won’t need to find a park to take your dog for its daily walk. But if you do prefer parks, San Francisco has those, too. There are about 3.7 dog parks per 100,000 residents in San Francisco. Tack on top 25 scores in metrics like dog-friendly restaurants and dog-friendly shopping centers and you may wonder why San Francisco fell to the fourth spot. The cost of living in San Francisco hurts its score. The median home in San Francisco is worth over $1 million, meaning you will likely need to have a high-paying job to afford your California mortgage payments and care for your dog. If you prefer doing things with your dog, whether it’s shopping, eating or lounging, San Diego might be the city for you. It has the second-most dog-friendly restaurants and the fourth-most dog-friendly shopping centers in the study. As in San Francisco, the main concern about living in San Diego is affordability. San Diego ranks 89th for median home value. The Windy City takes the sixth spot, an improvement on last year’s finish of 10th. Chicago has a walkability score of 77.8, 555 dog friendly-restaurants and four dog-friendly shopping centers. In all of those metrics, Chicago has a top 10 ranking. While Chicago’s other scores are not spectacular, they are no worse than average. The city is fairly affordable, ranking 65th for home value and 54th for average annual precipitation. Denver takes seventh. The Mile High City is full of great dog-friendly hiking trails to enjoy with your pup. But there is more than just the local hills to enjoy with your dog in Denver. This city ranks in the top third for all but one metric. Denver’s highlights include the seventh-most dog-friendly shopping centers in the study and the 25th-highest walkability score. The only metric to growl at in Denver is affordability. Home prices have been shooting up recently and, according to our data, Denver ranks 80th in this metric. According to some estimates there are around 455,000 dogs in New York City. That means nearly one dog for every 20 people. According to the same data, Manhattan leads the way as the most dog-obsessed borough. It had the most licensed dogs as of 2017. But New York is more than just a dog-populated city, it is also a dog-friendly city. New York is the most walkable city in America, something any dog and dog-owner can appreciate. There are also plenty of restaurants and shopping centers which cater to dog-owning residents. The two downsides to owning a dog here are New York’s cost of living and its weather. The city faces 76 days of rain per year on average, the most in our top 10. Minneapolis is a great city for dog owners who want a little bit of everything. The city ranks in the top 60 in every metric we tracked. Notable scores include 1.7 dog parks per 100,000 residents (a top 25 score) and 172 dog-friendly restaurants (another top 25 score). This city even has the fourth-lowest cost of living in our top 10. What drops Minneapolis to ninth is the lack of top 10 scores. California’s capital takes the last spot in the top 10. Dogs and their owners will appreciate the large numbers of dog parks. According to our research, Sacramento has the 16th-most dog parks per resident in the study, meaning most parks shouldn’t be too crowded. Other metrics in Sacramento’s favor include the low chance of rain and a large number of dog-friendly restaurants. 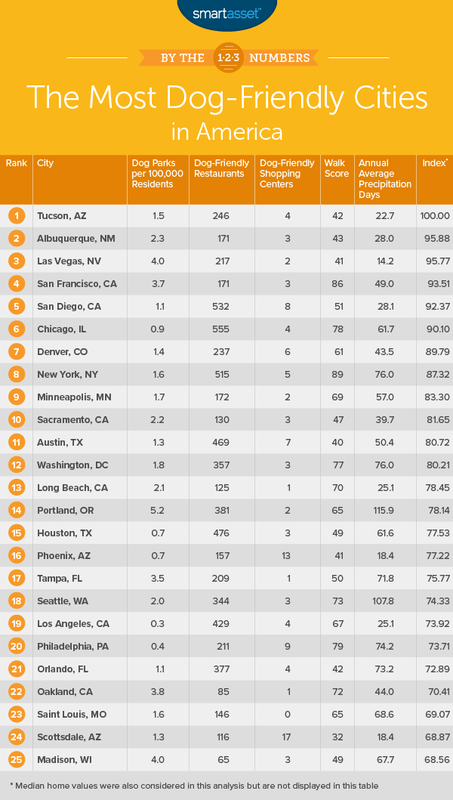 In each of those metrics, Sacramento ranks in the top 30. Dog parks per 100,000 residents. This metric looks at the number of dog parks per 100,000 residents. Data comes from the 2018 ParkScore. Dog-friendly restaurants. This factor looks at the number of restaurants that allow dogs in outdoor seating areas. This data comes from BringFido.com and was pulled in June 2018. Dog-friendly shops. This metric represents the number of shops that will allow dogs inside. This data comes from BringFido.com and was pulled in June 2018. Median home value. Data comes from the Census Bureau’s 2016 1-year American Community Survey. Walk score. This factor measures the walkability of each city. Data comes from Walk Score. Average annual days of precipitation. This metric looks at the average number of days a year that a state gets precipitation. Data comes from CurrentResults.com. We ranked each city across each of the factors and averaged the rankings, giving different weighting to each metric. Dog parks, dog-friendly restaurants and dog-friendly shops received a 20% weighting. Walk score and average days of precipitation received 15% weighting. Finally, median home value received a 10% weighting. Using the average weighting, we created our final score. The city with the best average ranking received a score of 100. The city with the worst average ranking received a 0. You don’t have to buy – If you are new to a city, it may make sense to wait before you buy. There are a few reasons for this. First, you’ll likely want to take some time to get to know a city. If you rush to buy a home in a place you decide you don’t like, you will probably lose money and time having to sell it, especially after factoring in closing costs. Another benefit to renting is flexibility. If you don’t know how long you are going to be in a city it probably makes more sense to rent instead of buy until you can be certain of your long-term plans. Property taxes hurt – If you are a seasoned homeowner, you know how property taxes can affect affordability. But if you are just starting the search for your first home, you may be surprised to find out how much property taxes cost. The average U.S. homeowner pays over $2,300 per year in property taxes, but based on where you live that number varies wildly. Average Florida property taxes for example cost under $1,800 per year, while average New Hampshire property taxes cost around $5,500 per year. Get an expert opinion – Your home is likely the most expensive purchase you will make in your lifetime. So it makes sense to get as much good advice as you can. If you are looking for the best advice, a financial advisor can help you decide if homeownership is right for you, or if it fits into your long-term plan. To find a local financial advisor try SmartAsset’s financial advisor matching tool. It will match you with up to three local financial advisors who fit your specific requirements.